Sheriff Bill Mullen’s remarkable 47 year law enforcement career began in 1969 when he was hired by the Pittsburgh Police Patrol Officer and has spent his years in the field moving up the ranks in Allegheny County. Before becoming Sheriff, he previously served as an Allegheny County Narcotics Detective, Homicide Lieutenant, Commander, Assistant Chief of Operations, Assistant Chief of Investigations and Deputy Chief and second in command of the 1,100 plus member police force. 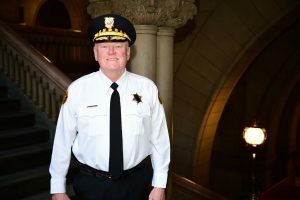 Since then, Sheriff Mullen has been elected as the Allegheny County Sheriff three times, consecutively, since 2006 and has dedicated a decade of service to making the Sheriff’s Office more efficient for the residents of Allegheny County. When Sheriff Mullen was elected, he implemented a plan that included directing the reorganization of the office, curbing the heroin epidemic, and establishing new innovative trainings for officers. These efforts successfully led the Sheriff’s department to come in under budget every single year since Sheriff Mullen took over while subsequently transforming the office. Sheriff Mullen’s reorganization of the office started with initiatives to maximize the efficiency of the reporting systems and the purchasing of new innovative training systems for the county office, which came at no expense to taxpayers. The Sheriff promoted Go Green efforts by acquiring grant funding for an automated computer reporting system to diminish paperwork and generate a more competent report tracking procedure. In addition, the Sheriff ordered to install laptop computers in the Sheriff’s vehicles to automate systems and provide the most efficient service of civil process. These new plans worked to renovate the previous systems in place and created a more cost-effective alternative for reporting in the county office. Sheriff Mullen also ordered for the purchase of a wheelchair accessible emergency vehicle to transport handicapped prisons (prisoners) at no cost to taxpayers, an initiative projected by the Health Department to save the County over $500,000 in private ambulance services. During his decade of service, Sheriff Mullen was also devoted to confronting the opioid epidemic. Some 80% of heroin users were first addicted to opioids and narcotics, and reported stealing those drugs from family and friends. Sheriff Mullen created Project D.U.M.P. (Disposal of Unused Medications Properly), which sends an evidence technician to pick up and dispose of unwanted prescription medications from a resident’s home with just one call. The program provides for the anonymous pick-up and disposal of unwanted narcotic medication from local homes. Since Sheriff Mullen established project D.U.M.P. to help reduce opioid and heroin related deaths in Allegheny County over 860 lbs of opiate medications have been recovered through the program. The Sheriff has also created new forms of training, and standards for deputies in the Allegheny County office over the years. These new trainings have led deputies to enhanced on the job training in order to create better management. The Sheriff enrolled all transportation deputies in the Law Enforcement Officers Flying Armed training course conducted by the U.S. Department of Homeland Security Transportation Security Administration. He also required deputies to receive innovative training on critical, job related subjects such as courthouse security, hostage negotiations, terrorism, and warrant service. The Sheriff wanted to commit deputies to law enforcement task forces that would be assigned to work on major investigations. This led to the deputies being credited for disassembling key gang and drug networks influencing the ascension of crime in Braddock, Clairton, Hazelwood, Homewood, and McKeesport areas. Sheriff Mullen is an Alumus of the University of Dayton with a bachelor’s degree in Political Science, and a graduate of the F.B.I. National Academy in Quantico Virginia, Disaster Management School in Emmitsburg, Maryland and the John F. Kennedy School of Government at Harvard University. He has earned management course certificates from institutions including Penn State University, University of Pittsburgh, University of Delaware, the Command Institute for Police Executives and the Police Executive Research Forum. As Sheriff, he attended the National Sheriffs’ Institute in Longmont, Colorado and participated in the Managing Police Discipline seminar. Sheriff Mullen is married to Judy, his wife of 43 years. Life-long residents of Allegheny County, they currently reside in the City of Pittsburgh and have two sons and a granddaughter.